The Maker Movement is the idea that anyone, no matter your background, skill level, or interest can be a creator. It encourages collaboration, problem-solving, innovative thinking, and the desire to bring dreams to reality. The plethora of “how-to” videos on anything you can imagine on YouTube, has fueled the notion that everyone has can be a maker! These Makerspaces, community-based centers focused on the Maker Movement, are popping up in libraries, schools, and other community locations and are stocked with resources to help visitors create. From simple craft supplies, scrap wood, fabric, and materials found in the recycling bin, to 3D printers, laser cutters, CAD software, hand tools, power tools, CNC machines and so much more, the maker spaces provide just about everything you need to start creating! People, especially students, who previously may not have been able to access such innovative tools, are now able to bring their ideas and creations to life. The Maker Movement is thriving all over, and Hopewell City Public Schools is no exception. We seek to bring the Maker values of design, creation, perseverance, and problem solving to students all across the division with the establishment of our own school-based makerspaces. Thanks to innovative practices centered around project-based learning, our students are embracing maker mindsets that support risk-taking, collaborating, creativity, and growth mindset. 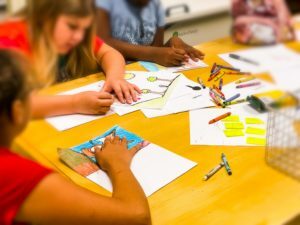 Over the last two months, HCPS students across the division have been given the opportunity to visit their school’s makerspace, and their excitement is palpable! Their eagerness to explore the materials and to try new things has been transformational to their deeper learning journey. The students at Dupont Elementary were first introduced to the space by reflecting on what it means to be a maker. After watching Barney Saltzberg, the author of “The Beautiful Oops”, explain his process for turning mistakes into stories, the students were challenged to turn their own “oops” into something beautiful and write about their creation. Students are letting go and allowing their personal passions to spark their creativity in the makerspace. A group of fifth graders used their love of yoga as inspiration to make their own yoga video for kindergarten. They took what they learned about the calming effects that the poses have on them to create a video inspired by the Eric Carle book, “Brown Bear, Brown Bear”. After practicing and researching a variety of yoga poses, the group chose an animal and coordinating pose that spoke to them. 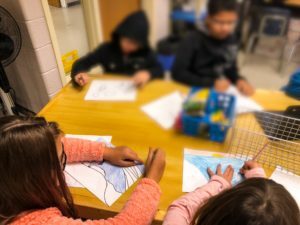 They continued the research bylearning how to draw their chosen animal and then going through the critique process to give each other kind, helpful, and specific feedback on their drawings. The final draft of their animal will be used as the background as they model their chosen pose using GreenScreen by DoInk. Once the videos are complete, the group will visit kindergarten friends and teach them yoga using their video compilation. Students will be proudly displaying their work at our community Winter Exhibition on December 11, 2018. We are looking forward to continuing our makerspace journey, and can’t wait to share models of excellence and innovation. 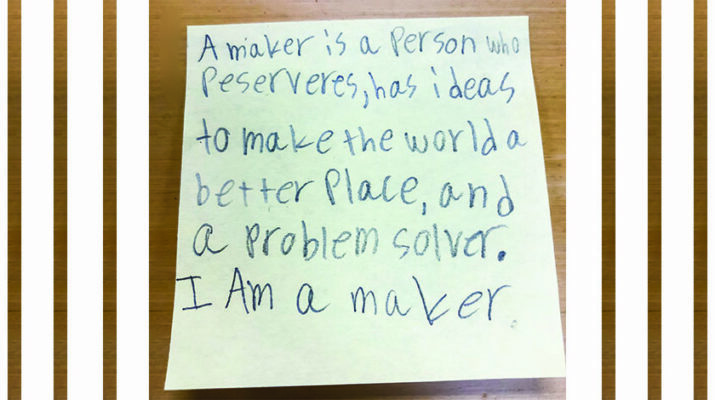 How will you join the Maker Movement? Susannah Bishop has been teaching for 20 years and working with Hopewell City Public Schools for the last nine. She currently serves as an ITRT and Deeper Learning Coach in their Department of Innovation at the elementary and secondary level. She enjoys helping educators refine their practice and spending time in the makerspace, guiding students along their maker journey. Join in with 180+ Countries and Tens of Millions of Students Around the World as they Celebrate the Hour of Code™️!